ON NOW 30% OFF ALL FLY MATERIAL TILL SAT 21TH ALL FRESH & SALTWATER FURS, HAIRS, FEATHERS, SYNTHETIC ,THREADS, WIRE, LEAD, TINSEL, AND MORE. The Snowy Lakes Strategy Working Group met at Jindabyne on 28 May 2014 and NSW Department of Primary Industries (Fisheries) managers and researchers met on the following day to discuss the outcomes, before presenting to a three hour public meeting of about 120 people convened by Fisheries at Cooma on the evening of 29 May. Not surprisingly, the main topic over the couple of days was the recent downturn in the rainbow trout fishery which, after some spectacular seasons in both Lake Eucumbene and Lake Jindabyne, has delivered two very disappointing spawning runs and poor shore-based rainbow fishing over the past two summers. Rainbow fishing has been difficult but anglers using electronic fish finders say they are seeing many fish deep in the lake and are still catching rainbows when trolling. This isn’t much comfort to most anglers who are only equipped to catch fish from the shore. The ‘catchability’ of rainbows underpins not just recreational angling ‘customer satisfaction’ (very important in a fishery stocked with fish the anglers have paid for with their licences) but also to a local economy that as long ago as 2001 was estimated in a report by Dominion Consulting to be worth around $70 million to the region every year. Curiously, the brown trout fishery seems to be unaffected, with this year’s spawning run described by many as the best in over 20 years. Whether this winter’s rainbow run will again be poor remains to be seen over the next few months—last year the run was barely adequate to provide the numbers needed for stripping for the Gaden Trout Hatchery annual breeding program. Cameron Westaway, Fisheries’ Senior Fisheries Manager Inland, fronted both the 28 May management meeting of the Snowy Lakes Strategy Working Group and the 29 May public meeting at Cooma and said that at this stage no one knows the reason for the recent problem with the rainbows with any certainty. Dr Michel Dedual from the New Zealand Department of Conservation and the principal Fisheries Scientist working on Lake Taupo had been invited across from New Zealand for advice and presented on the management regime on Lake Taupo. The Taupo fishery has benefited from many decades of research into fish numbers and size (dating back over 100 years), and also constant research into fishing pressure, catch effort, creel data and angler satisfaction. When asked what are the absolutely essential management tools he has at his disposal, Dr Dedual answered the creel surveys and the fish trap data—the Snowy Lakes fishery does not have a current creel survey and our trap data is more limited. Despite its reputation as a world class fishery, Taupo has its own problems and the solutions are just as elusive. It was noticeable that despite the far more intensive management of the Taupo fishery, Dr Dedual’s graphs showed a continuous decline in fish size as well as a recent and rapid shift in the spawning run habits: 10 years ago the fish spawned throughout the entire year with a peak building in June and lasting through to November; now the fish are not running at all in many months, the spawning run doesn’t start until July, peaks in October and by November is dropping sharply. It seems the reasons for this late and compressed spawning run are not understood. The public meeting at Cooma on the evening of 29 May lasted three hours and basically presented the same information as the Snowy Lakes Strategy Working Group saw the previous day. The presentations seemed too detailed and complicated for many in the audience but nonetheless there were well-informed questions, particularly related to research priorities. Questions at the meeting included querying why monitoring and creel surveys undertaken by Fisheries from the 1960s through to the 1980s were not kept up (Mr Westaway explained that they were overcome by other priorities at the time and the format of the surveys may have had statistical problems); whether too much money was being spent on natives at the expense of the salmonid fishery; whether Gaden Trout Hatchery staff were releasing fish in such a way that ensured good survival rates; and whether the opening of the season on the spawning rivers should be delayed so that the rainbows (which sometimes spawn well into October and even November) would be better protected. There were several questions about the effect of Snowy Hydro’s cloud seeding program (Charlie Litchfield, Environment and Lands Manager at Snowy Hydro Limited, told the meeting that no traces of silver iodide had been found in the lakes after independent analysis by the National Resources Commission). Some questions were asked about whether adjustment of size limits and catch/bag limits are needed, and there were also questions about whether Atlantic salmon and brook trout are out-competing rainbows (despite the fact that neither of the latter two fish are present in Eucumbene). But the main questions were about why more money isn’t being spent on the research and monitoring that this recent crisis has shown to be necessary. Mr Westaway told the meeting that he would like to spend more money on research across all freshwater fisheries , but that the funds (which would normally have to come from the licence-funded Recreational Fishing Freshwater Trust) were simply not available for doing all the research that he would like and that alternative funding streams, such as direct sponsorship of research by universities through donations by fishing clubs, needed to be considered. Engagement with and communication to anglers was mentioned in both Mr Westaway’s and Dr Dedual’s presentations. Questions from the floor of the public meeting revealed how ineffective this has been in the past. It was obvious that many people had little or no knowledge of the stocking process and the involvement of volunteers through the acclimatisation societies, and many had no engagement with Fisheries through websites, newsletters, social media and via fishing clubs. Considering that those interested enough to attend the meeting were probably better-informed than most anglers, the lack of knowledge is worrying. There also seemed to be an expectation by some that the fishery could somehow return to the ‘good old days’, with little understanding that past research and data is no longer reliable or relevant, especially in the light of varying environmental conditions, fishing pressure, limnology and other changes. The conclusions reached by Fisheries during and after the Snowy Lakes Strategy meeting, and then presented by Fisheries to the public at the Cooma meeting, were “1) improved spawning run monitoring is needed, 2) productivity/limnology research is needed and 3) creel surveys are needed, each of which must be cost effective”. Comments from the public at the Cooma meeting will presumably be taken into account before these conclusions are finalised. There needs to be continuing and improved monitoring and data collection from spawning runs as well as research into the overall population of fish in the lakes (keeping in mind that the fish encountered during the spawning run don’t necessarily represent the overall population). There needs to be research into the limnology and biological productivity of the lakes. The lakes are constantly changing: shorelines are eroding and becoming more gravelly, fine sediments are gradually settling to the lower parts of the lake, recent droughts may have affected shoreline productivity, climate change is already affecting temperatures and weather in the Snowy Mountains, the dead trees are gradually disappearing, ski field development might be affecting the water quality in Jindabyne...and so on. These are just some of the factors that affect the lakes’ biological productivity from the bottom of the food chain all the way to the rainbows at the top, and such changes may have affected the rainbows’ diet, causing them to change feeding habits. Creel surveys are needed—not the old fashioned self-administered surveys which are scientifically unreliable, but tightly controlled surveys such as Fisheries’ recent Murrumbidgee River survey. Whatever research initiatives are undertaken need to be cost effective. The NSW fishing licence fee of $35 per annum currently delivers about $4.15 million into the Recreational Fishing Freshwater Trust (that's 30% of the total licence income, the other 70% goes into the Recreational Fishing Saltwater Trust). These funds have to be spread across the entire NSW freshwater recreational fishery and obviously can’t fund a lot of extensive and expensive research programs. The special NZ fishing licence required just for Lake Taupo costs $90 per annum and about 42,000 are sold, raising roughly $3.75 million for that fishery alone, although under special legislation, the government makes a payment equivalent to half of the annual proceeds from boating and fishing licences to Ngäti Tuwharetoa, the traditional owners. At a quick glance it looks like the Taupo managers have roughly same amount as we have for the entire NSW freshwater fishery to spend just on Taupo. Any research initiatives also need to be structured so they are not only sustainable and affordable over many years (which will be difficult given the frequent changes in direction from politicians and bureaucrats) but they will also need to allow for fast review and adjustment. The problem is too urgent and too important to the local economy to treat it any other way. All of the above initiatives were already prioritised in the current Snowy Lakes Trout Strategy (see the final page of that document) but have been in various stages of implementation, planning or postponement, subject to funding becoming available in the future. • If the Snowy Lakes fishery is important to you, make your views known to the Recreational Fishing Freshwater Trust Expenditure Committee. Lobby the committee to prioritise research spending to address this important fishery—committee member details are at www.dpi.nsw.gov.au/fisheries/recreational/licence-fee/trusts/rfftec/about-rfftec. • Stay in touch with the issues by being engaged with fishing organisations, Fisheries NSW newsletters, fishing forums and blogs. • Support the businesses that depend on the Snowy Lakes—tackle shops, camping grounds, guides, etc…they all suffer when the fishing isn’t good. 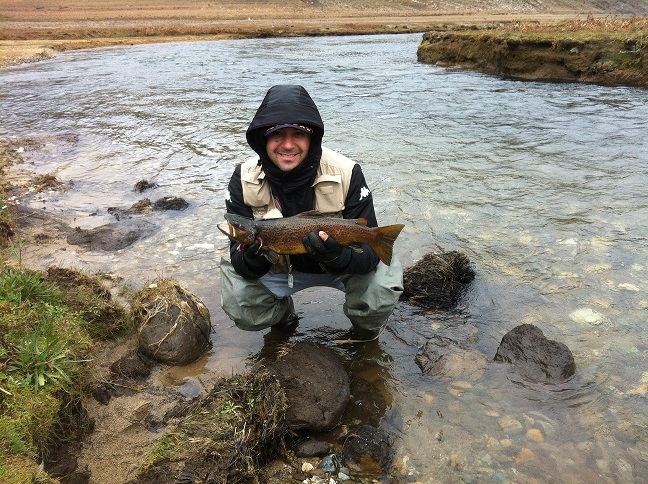 • If you have a fishing business in the Snowy Mountains, promote and share alternative fishing methods that suit difficult conditions. If you’ve got clients and customers that are catching fish, share the information. Keeping it top secret won’t do anyone any good in the long term. • Let us know what YOU think by replying to freshwaterfisher@viridia.com.au. Fisheries NSW is reviewing and updating the Snowy Lakes Trout Strategy document and expects to complete this in coming weeks. Trapping of the winter spawning run of rainbows at Gaden Trout Hatchery on the Thredbo River should start around the end of July, and the size of this year’s run will be critical—it will either reveal that the problem is as bad as most people suspect, or if the run is normal, that the rainbow population has not changed, but that their feeding patterns have. Funding of the research that is needed will become a hot topic in coming months. 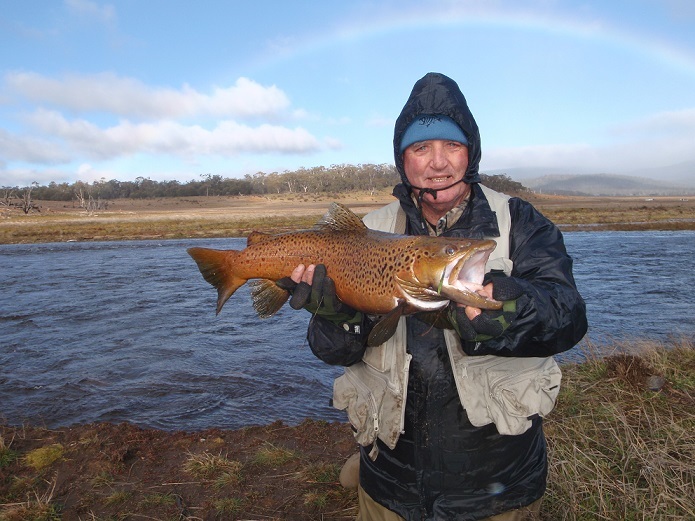 The Snowy Lakes are the premier trout fishery in NSW so we would hope that some priority will be given to the research. (Recommendations about any expenditure from fishing licence monies are made by the Recreational Freshwater Fishing Trust Expenditure Committee and endorsed by the Advisory Council on Recreational Fishing, before going to Minister for Primary Industries for final approval.) We expect that additional avenues of funding will also be explored by Fisheries. Fisheries intends to make some sort of public report in coming weeks once they have mulled over the issues. We will keep you up to date through this newsletter, through our Facebook page at www.facebook.com/nswcfa and anglers can also follow the Fisheries NSW Facebook page at www.facebook.com/NSWDPIFisheries . Foundation Members are recognised on a special page in the NSWCFA website and at the foot of NSWCFA newsletters. Just in case you want to publish this report and pic. 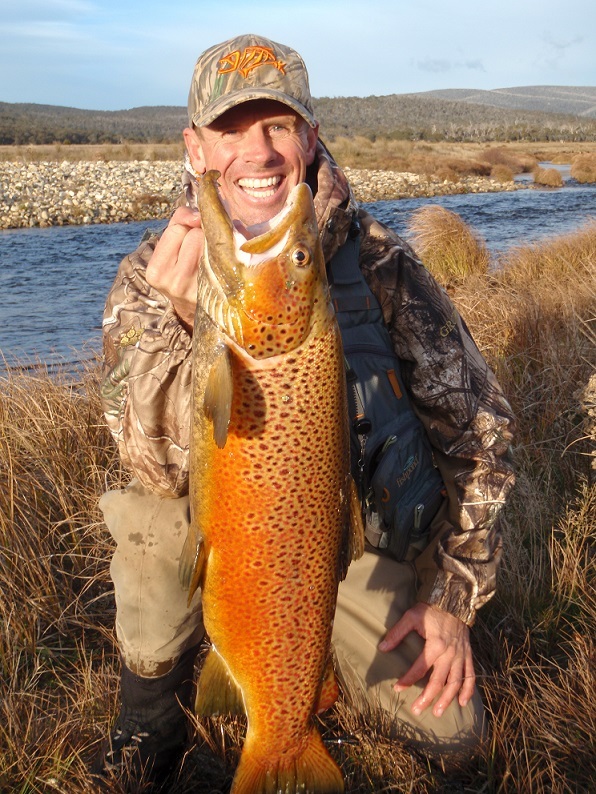 The Eucumbene River fished slower than the last two days. Fish are there but very spooky. If you put in the time and fished deep holes patiently you got results. I got this brown on a nymph dropper. Lost a 6 pounder as fish only snapping at flys.